Raghuveer Singh Gaur is a familiar face to us at Delhi’s Avatar Meher Baba Centre. He used to join our centre’s anniversary celebrations and speak about Meher Baba and His message. The last time I saw him speak at our centre was some eight -nine years back. When I met him after his speech, he appeared as a person next door, friendly, jovial, and deeply interested in spirituality. That meeting did not prepare me for what I have since come across. More so after the public snub he had received from Dr G S N Moorthy, a Meher Baba lover. About the snub a little while later. For the uninitiated, let me introduce Moorthy, a Telugu orthodox Brahmin, who had his roots in Khargpur, but lived for long years in Dehradun, which Meher Baba once described as his Brindavan. As long as his health permitted, Moorthy attended Delhi centre’s anniversary celebrated from the first to the third of December every year. Before getting drawn towards Meher Baba, Moorthy was a Vedanta scholar. After coming into Meher Baba’s fold, he became His Vivekananda, and he lived unto that epithet speaking about Baba at big and small gatherings around the world. His Vedantic roots used to trouble the likes of me because his explanations, say, for expressions like “Lehar” used to be gobbledygook. But it is a different matter altogether. To cut to Gaur, he appears to have transformed into a Guru in his own right since I heard him speak in Delhi Centre. When the transformation came about is unclear. 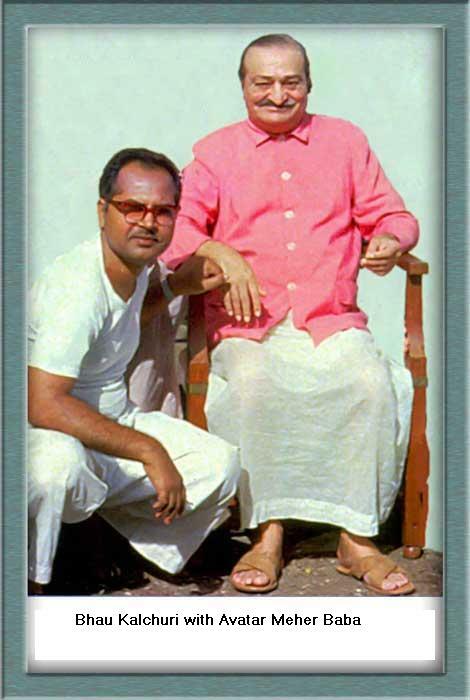 The website devoted to him, website ( http://www.worldspiritualfoundation.com) does not mention the time –line though it speaks about his childhood feats, gives an account of how as a seven-year-old Gaur started his spiritual training at the feet of a “god-realized” saint Pujyapad Swami Ramgiri Ji Maharaj, how at the age of 14 he wandered the Himalayas and learnt the intricacies of Tantra from the Tibetan Lamas and how he reinvigorated his spiritual energy by serving enlightened souls like Paramhans Baba Bajrangdas Mahatyagi, Samade Wale Paramhans, Om Sarkar and Mahayogini MaParamsidha. The narrative abruptly switches to “mature” Raghuveer, and declares that he had become “an Acharya” while remaining silent on specifics. “Now he was Acharya Raghuveer Singh Gaur. But his real battlefield was neither the academics nor the day-to-day affair of a commoner. It lay somewhere else. It was in the spiritual Armageddon where he had to shape the destiny of humankind. The life defining moment in the life of Dr. Gaur was just inches ahead…” it tells the reader. What was the life defining moment? When did it arrive? Again the time-line is absent with the narrative telling the reader that Meher Baba gave a tight hug to Gaur when he entered His Samadhi. Reading the above lines, I felt really envy of Gaur. Though I have been visiting the Samadhi Shrine, I never had such a moment that would remain etched on the mind for eternity. My first visit to the Tomb Shrine, as we call the place that houses the Samadhi of Meher Baba, was two-days after the Avatar dropped His physical body, and Baba was lying in the crypt surrounded by ice slabs. Since then I have become a regular face at the Holy place. In a manner of speaking I am a witness to what we may call the suomoto growth of Meherabad because though Baba has stated that the place would become the Jerusalem of the world, none of my generation, who came to Him in the late sixties while still in the college, had imagined that we could see the place milling with a few hundred people during our life time. For the First Amartithi, I could drive up the hill in a taxi just before Silence was announced, and have Darshan within no time. Till she joined Baba in Jan 1999, my mother used to invoke her senior citizen status to have “Darshan” three times on all the three-days of Amartithi. Today, even on a normal working day, I have to stand in the line often waiting for more than an hour for my turn to reach the gate of the Samadhi. So, it is natural for me to envy Gaur. But nobody has spoken about Gaur’s experience. Not the regulars to the Shrine, not even Saligram Sharma, whom I knew fairly well, and who, according to the Gaur web site, became the first spiritual disciple of Boy Gaur. This Saligram Sharma, I am referring to, is from Hamirpur, which is steeped in love for Meher Baba. Since we are on Meher Baba, I presume the Sharma in the Gaur narrative and the Sharma I know are the same. Presumptions need not necessarily be true, of course. Now I have a serious problem with the next turn in the website’s narrative. “The hug of Avatar Meher Baba was supposed to be his silent approval to kick-start the pivotal worldwide task of permeating the message of love and spiritual consciousness amongst us the lost and deviated souls. Acharya Gaur blasted the irrevocable and invincible bugle to conquer the world spiritually. He founded the World Spiritual Foundation with its Head Office at Shivpuri & its branches now established all over the world”. 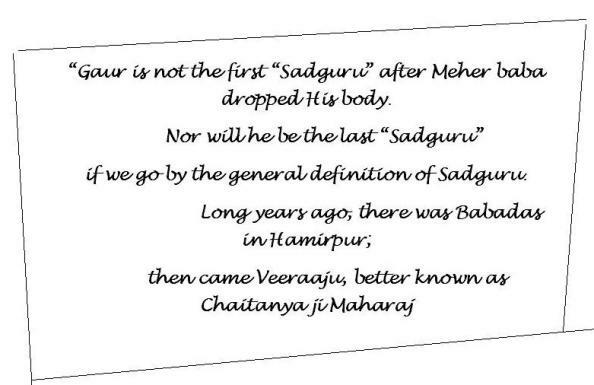 From what I have known and heard, Gaur is not the first “Sadguru” after Meher baba dropped His body. Nor will he be the last “Sadguru” if we go by the general definition of Sadguru. Long years ago, Babadas, who had awakened Hamirpur to Meher Baba’s Message, had tried to present himself as one. He was ticked off and told not to take His name by none other than Meher Baba himself. In the early seventies, that is a couple of years after Meher Baba dropped His physical body, Andhra Pradesh produced its own Sadguru tied to the apron of Meher Baba. Veeraaju, better known as Chaitanya Maharaj, became a draw for a large section of Telugu speaking Meher Baba lovers, particularly from the East and West Godavari districts. The camp worshipped Meher Baba, no doubt, but it did not stop them to create a cult around “Maharaj” and his wife, Gayatri, saying that Maharaj was the Sadguru successor to the Avatar of the Age. Frankly, the likes of me have no quarrel with them or with the puja (worship with flowers, followed by prayers and aarti) that was reportedly offered to the husband-wife. The world is full of wonders – some real and some fake. There is place for everything under the sun. You pick the wonder that your sanskaras make you get attracted. Yet, the likes of me can neither afford to forget nor stop drawing the attention of the likes of Chaitanya Maharaj and Acharya Gaur to what Meher Baba repeatedly said namely Avatar, who is God Man doesn’t fade away after He drops His physical body. He remains with us, invisible to normal eye but more active than ever before, working through His circle till the next advent. Many members of the circle may not know Who He is and Where He is but implicitly carry out His wish. So much so He doesn’t need second-in commands when He is physically present and successors after He drops His body. I have not read many books on Meher Baba. I purchased God Speaks in English and all the three translations in Telugu and one in Hindi. I have not read the book beyond the first few pages though Baba said, according to Mehru, a member of Baba’s women Mandali, one should read it without bothering about the meanings behind the words, secure in the knowledge that Baba Himself will make you understand the secrets of God Speaks when the Time comes. What I read and heard, however, helped me to answer the queries – Who is the successor to Meher Baba at Meherabad? How can there be no successor to Mutt/ Petham/Trust? Some used to be annoyed with my replies. Some used to laugh away at what they used to see as my idiocity in Meher Baba. What was my reply? It was not a complicated Vedanta mix nor was it a quote from Meher Baba’s Discourses. It was simple every day experience. Do you have a successor to your father? You don’t. Father is Father, whether he is with you physically or not. You cannot have different fathers for different occasions. During my student days, I came across a play by an acclaimed Telugu writer, Advishnu. The title was: Wanted Fathers. The story revolves round four bachelors, who donot know how to get married. The parents were opposed to the girls they are in deep love . “If we can manage to get one father like figure, our problem will be solved. If one kanyadan is performed that is enough; the new couple can perform the other two marriages”, says the hero disparate to find a father. We are fortunately not in the same bracket as the hero of “Wanted Fathers”. We know who our divine father is. And what does He want? He wants us to hold on to His Daman, and tells us it is possible if we remember Him in our day –to-day life. He has prescribed neither a puja nor ritual worship. He has created no cult, no religion. He has left behind no one single soul who can interpret Him to the world. Eruch Jessawala and Adi K Irani, who were with Meher Baba from their childhood, had never claimed to be Baba’s spokesmen. Both were eye witnesses to several phases in Baba’s work. And they had really deep understanding of whatever Baba said. Yet, their narrative used to begin thus: Baba used to say, Baba said and so on. It is that it is not fair for any one single person to claim the status of divine anointed/God realised Sadguru for Meher Baba’s cause. Certainly out of place will be anyone promoting himself as a Sadguru using Avatar Meher Baba’s photo, flag, and “Mastery in Servitude” symbol, as a backdrop. This is what Chaitanya Maharaj did in Andhra Pradesh. This is what Acharya Raghuveer Singh Gaur appears to be doing, going by his presence on the YouTube. One impression his website leaves behind is that there is an effort – conscious or otherwise, to create a Gaur cult, with miracles ascribed to him. Whether it is right or wrong is for his camp to analyse. Says a post on his website “Previously, the masters were seen doing Shaktipaat to their chosen few staunch disciples. But here in the hall of Acharya Gaur Shakitpaat is distributed like sweets in a candy shop, to all who need it, to the commoners and the rich alike. Currently, 67 very important sites on meditation all over the world are showing Acharya Gaur’s YouTube videos as the only practical example of real Shaktipaat”. In so far Meher Baba is concerned, we know on the authority of none other than Baba himself that He doesn’t perform miracles. If anyone thinks so, it is a mistaken impression, he said once and declared that He would do only one miracle and that is waking up the world. If this is indeed so, how the miracles are happening and how some people impressed by such miracles are getting drawn to Meherabad? During a visit to a Maruti Service Station at Yerwada, Pune, a supervisor asked me about visiting Baba Samadhi. I asked him why he was interested in Baba. He replied: “In my neighbourhood, there is a childless couple. They got a child after visiting Meher Baba Samadhi”. Bhau Kalchuri, the last member of Meher Baba’s resident Mandali (he joined his beloved last October) solved the puzzle once during his internet chat. “Baba himself said that the miracles are performed by souls in agony to please Him hoping to complete their birth-death cycle”, he stated. Bhauji, as we used to address him, elevated me to the Kalchuri dynasty and gave me a new name: Ramsingh Kalchuri. He used to ask me to put black colour to my hair. I could not pull the courage to do so. For over forty five years, white hair has been my trade mark. What people will think if I turn it into black in my sixties? Still I gave it a new colour one Sunday – light grey. He was not pleased. He did not speak with me that day. By the time I managed to convince myself to fulfill his wish, Baba called Bhauji. And he left leaving me with a life-long regret. I began with a reference to GSN Moorthi. So it will be fair to reproduce what the Gaur site says about him. “There was one towering personality named Late Dr. G.S.N Moorthi. 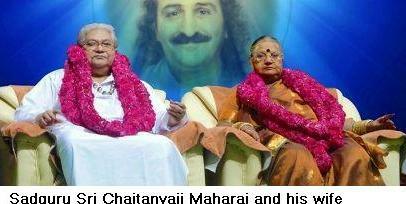 He was a disciple of Avatar Meher Baba and Baba called him the Vivekananda of the modem Age. Once he visited Shivpuri and spent some time with Acharya Gaur. He was so moved by the deep and compassionate persona of Acharya Gaur and so hooked on with the Shaktipaat of Acharya Gaur that he could hardly resist and made a vociferous announcement before the local media men that Acharya Gaur was the first original founder of the Supra Mental Meditation”. I have no way to cross check the above statement. To give a benefit of doubt, Moorthy might have said the remarks attributed to him. No problem. It doesn’t square with two nuggets I know. Moorthy was among the first converts to Chaitanya Maharaj. Like Swamy Satyaprakash Udaseen, he too landed in Mandapet, the Maharaj turf near Rajahmundry. Moorthy returned to Baba’s Brindavan after a few months. Swamy became Satyaprakash Meherananda and remained at Mandapet. I stayed at Swamyji Meher Vihar (a two bed-room ground floor unit in a single story house in Hyderabad’s Himayat Nagar) in late sixties. So I wrote him a letter congratulating him on long overdue name change, and stopping my subscription to Divya Vani, a monthly edited by him till be breathed his last. He replied agreeing with me that he should have changed his name a long while ago, and voiced the hope that I would resume my subscription to Divya Vani one day. His hope remained a hope. He found himself uncomfortable with Gaur’s interpretations of past avatars while speaking about Meher Baba, particularly juxtaposing Baba and Krishna. . So, like a headmaster, Moorthy ticked him off, made him stop his verbosity and told him bluntly “donot speak like this again…” And added such interpretations only give bad name or something to that affect. The occasion for the snub, as I said at the outset was Delhi centre’s anniversary. Moorthy was in chair. Gaur was one of the guest speakers. It was the only time I saw Murthy as a personification of anger. The foregoing is not a case against Sadguru Gaur or his mission. It is his conviction that makes him do what he is doing, meditation including. Meher Baba is not against meditation per se but did not prescribe to everyone. 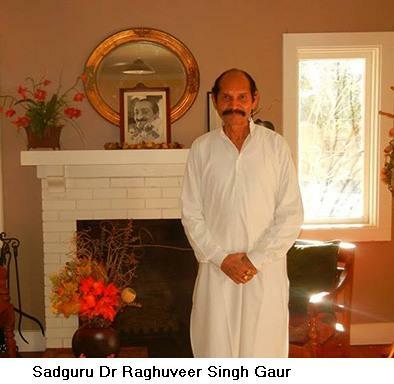 Yet, it is difficult to resist the temptation to point out that Sadguru Dr Raghuveer Singh Gaur’s clarion call, as his web site puts, doesn’t jell well what we know Meher Baba has been saying about His work. Meher Baba says: “I have come not to teach you but to awaken you”. He also says: “I do My work. You needn’t worry how to do My work”. Needless to say for the likes of me it is difficult to go along with Gaur call. Also with the aim of his World Spiritual Foundation: “spiritual enhancement of the individual self and guiding it to the ultimate journey of communion with God Almighty”. And its assertion: “The foundation is a place where the incarnation of the God in the Modern’ Era ‘Avatar Meher baba’ resides in every heart”. Pertinent in this context is what Meher Baba said three-years before He dropped His physical body. He said: Shun those masters, who are like multi-coloured electric signs that flash on and off, brightening the dark sky of your world and leaving you in darkness again”. Equally pertinent is Meher Baba’s Last Warning as He called it in July 1968. It was not a warning meant for the general public. It was warning to those who love Him, who obey Him and all who would want to do so. “It is equally important at this critical period of the Avataric Age to beware at all times of persons who lead others into believing that they are saintly and pious and profess to possess supernatural powers. However pious such persons appear to be, a Baba-lover must never mix such piety with the Divinity of the Avatar! “His lovers and workers should never get involved with such persons and affairs, much less with perverted “helpers of humanity” who have no reverence or regard for the Perfect Masters and the Avatar of the age. Beware of them who exploit spirituality to gain their selfish ends and dupe others in the name of Sadgurus and the Avatar”, read the message. I rest my case secure in the belief that when I have the Avatar of the Age by my side, I don’t have to search for the saints whether self-anointed or hailed as such by people in search of saints with supernatural powers. This entry was posted in Meher Baba Speaks, News and tagged Avatar, Avataric Legacy, Bhau Kalchuri, Bhauji, God Speaks, Meher Baba, Meherabad. Bookmark the permalink.